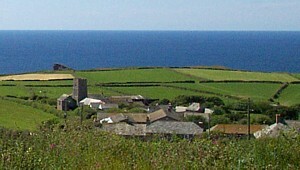 Trevalga is a sleepy little hamlet midway between Tintagel and Boscastle. The hamlet is pretty much all owned by one individual and the majority of cottages and houses, including the Manor House on the cliffs, are all let to local residents. There is a working farm here that dominates the hamlet. The farm grows a lot of potatoes. There is a church and a chapel and a village hall. Ladies window can be found at this headland. 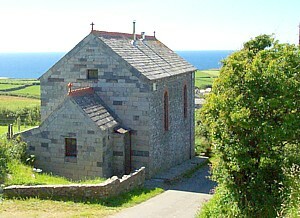 Trevalga Chapel (pic below) has a commanding view over Trevalga, with outstanding views to Tintagel and Boscastle. The chapel is now privately owned. 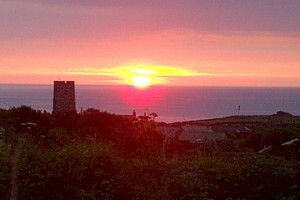 Sunset over Trevalga Church. The Church at Trevalga is dedicated to St Petroc. Trevalga hosts an annual fete during the early summer that attracts a good crowd. Rocky Valley and St Nectans Glen are a stones throw away at Trethevy.